Get help with your assignments without leaving your couch! For the times when you aren’t able to visit our Library Helpdesk on campus, we offer an online chat service, Chat to a Librarian. 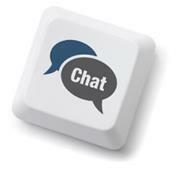 To get started, just hit the chat button on the QUT Library home page and fill in some basic information. One of our friendly librarians will be ready and waiting to answer your question. You can use the chat service to get help with finding information for your assignment, assistance using databases, and advice on referencing. To find the answers to some common library questions, try the AskQUT Library FAQ. There are some great tips on assignment research and writing available on Studywell. To have your Borrowing privileges restored, contact the Library either in person at a Help desk or by phone and they can help you with any overdue penalties. I am doing my research assignment: critical appraisal. Since i am referring only one journal is it ok to put a in-text refrencing at the end of the paragraph for each section. I would like to book a room for Saturday 18th October for a group of 5 to video a presentation. Are you able to do that through this forum? Yes, the Library does have Rooms for students to book. I can’t do that through this Blog no, but drop by a Library Help desk at any Campus; or Phone them or start a Chat and they can show you how to book a room for when you need it! Hi! Do we have free access to the Marketline website?